Lock in a great price for Park Lane Boutique Aparthotel – rated 9.3 by recent guests! We had two rooms. One slept 3 and a single for my adult nephew. The single room was clean but it smelled. The largeer room was perfect l, plenty of space, a balcony with partial sea views, but best of all Asma, the desk clerk was a sweet heart and very helpful. locations was also near plenty of restaurants and bus station, to get around the island. The breakfast was exceptional. There were many options to satisfy everyone. I loved everything! Breakfast is amazing (freshly cooked options, including pancakes, eggs benedict and omelette), the rooms are clean and spacious, the bed is super comfortable and the staff is AMAZING. Location is very convenient as it's right next to the bus terminal. Highly recommend this hotel! Excellent location, breakfast was fantastic and all the staff were amazing. Wonderful place to stay. Comfortable beds, great location, block away from the main bus terminal and public transportation. Spacious room and warm, friendly, professional staff. Park Lane Boutique Aparthotel This rating is a reflection of how the property compares to the industry standard when it comes to price, facilities and services available. It's based on a self-evaluation by the property. Use this rating to help choose your stay! One of our best sellers in St. Paul's Bay! 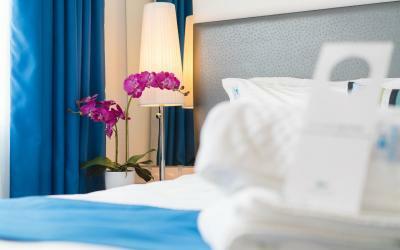 Park Lane Aparthotel is located on the Qawra peninsula with views of St.Paul’s Bay. It has a rooftop pool and terrace with panoramic views of the Mediterranean and offers free Wi-Fi and air-conditioned accommodations. 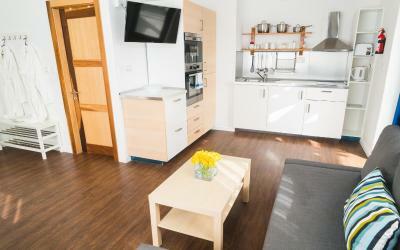 The studios and apartments include a kitchenette, a private bathroom and satellite TV. Rooms also come with tea/coffee making facilities and a small fridge. A continental breakfast, including a cooked-to-order breakfast, is served daily. The Park Lane also has a bar serving drinks throughout the day. These can be enjoyed on the furnished patio. Guests can relax in the lobby where there is a wide-screen TV. Staff can provide information and assistance on booking tours and trips throughout the island. The property is directly opposite Bugibba Bus Station. A shuttle service to/from Luqa Airport can be arranged on request. This property is also rated for the best value in St. Paul's Bay! Guests are getting more for their money when compared to other properties in this city. When would you like to stay at Park Lane Boutique Aparthotel? 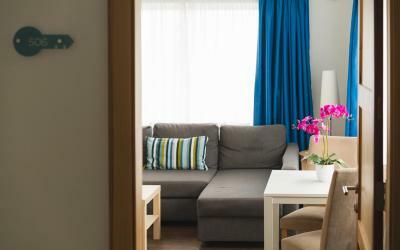 This modern open-plan studio features a furnished balcony, an LCD TV, and free Wi-Fi. It has a kitchenette, air conditioning, and a private bathroom with a hairdryer. All studios have a double bed. Spacious and modern, this air-conditioned apartment has a sitting/dining area with a kitchenette, free Wi-Fi, and a satellite flat-screen TV. The private bathroom includes free toiletries and a hairdryer, and the shower is in a separate room. This single room is equipped with a double bed, a fridge, tea and coffee making facilities and a private bathroom. It is air conditioned, has free WiFi, an LCD satellite TV and a window featuring an inland view. This spacious apartment is fully-equipped with kitchenette, dining area, private bathroom and a furnished balcony. 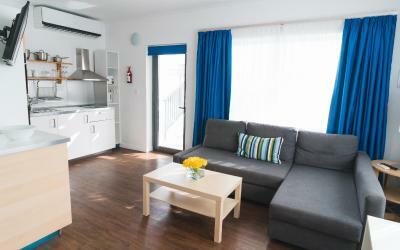 It is fully air-conditioned, has free Wi-Fi and a satellite flat-screen TV. It has twin beds and a comfortable sofa bed. This open-plan studio features a furnished balcony, a kitchenette and a private bathroom with a bath. 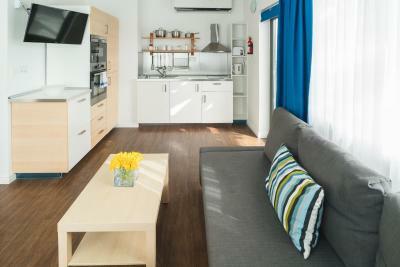 It includes air-conditioning, an LCD TV and free WiFi. All studios come with twin beds. This air-conditioned penthouse is on the 5th floor with furnished private terrace and views. It includes a kitchenette, dining area, lounge and private bathroom. It has free Wi-Fi and LCD satellite TV. Hi, my name is Andrea and I've been running this hotel ever since my family took up the venture 14 years ago. Running this hotel is so much more than a job to me; it is a challenge and my dream. In a small hotel like ours, staff numbers are few and formalities drop - we work as a family and our guests form part of the family. 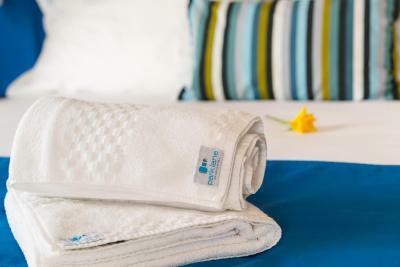 In fact, what makes our hotel stand out is how much we are ready to do and how far we will go out of our way to make your stay as easy and pleasant as possible! House Rules Park Lane Boutique Aparthotel takes special requests – add in the next step! Park Lane Boutique Aparthotel accepts these cards and reserves the right to temporarily hold an amount prior to arrival. Please note that the name of the credit card's holder has to correspond with the guest's name. The rooftop pool is open from April until October. Please inform Park Lane Boutique Aparthotel of your expected arrival time in advance. You can use the Special Requests box when booking, or contact the property directly using the contact details in your confirmation. Not one thing to note. Location hasn’t a sea view compared to some others places but it’s close to everything within almost 10mn walking. We were there beginning of April so we couldn’t take advantage of the swimming pool. I stayed 4 nights at the Parklane hotel and I can only recommend you to stay there. 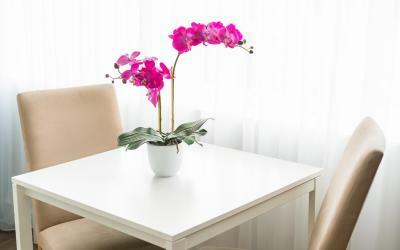 Staff is so welcoming and nice that you’ll feel quickly like home. The continental breakfast is excellent. The apartment was super clean and spacious and the bathroom was quite large and well equipped. WiFi was excellent for a free WiFi. To be honest, this is the best place in terms of quality price you could stay in San Pauli. Thanks Maya and the team ! You made us feeling happy and like home. We’ll definitely come back during the summer season ! The Bathroom is dated. If you have long hair, bring your own hairdryer. The one provided in the bathroom was terrible. The Hotel Staff was extremly friendly and helpfull. Breakfast was good. I liked the posibilitie of the cooked to order brakfast options. The location is good for exploring the Islands. Beds were very comftorable. Exceeded all expectations. The staff at this hotel are first class, friendly, upbeat and welcoming! Highly recommended. Wi-Fi was awful here throughout the stay, thankfully we could use our mobile data plans from the UK in Malta at no extra cost so we had access to the internet throughout the stay. Good location, very close to the bus station and the beach. Lovely, friendly staff, nice room. The very warm welcom service and the morning breakfest . The location is perfect if you are interested in touring the Island, as the bus Station is across the street. Everything was perfect. The staffs were ever so helpful and the rooms were great. Bathroom. Dark and open shower with a broken shower head. Balcony and front desk service. We could hear all the noise of the street and neighbors, in the first days the works in the street began at 06:30. For two days we woke up with a strange smell in the room. The kitchen and bathroom don't have ventilation. At check-out the "Manager" was very rude at the request of the Eco Tax, was the only one, the rest of the staff is very friendly. The breakfast is excellent and the staff are very friendly. The hotel is very close to the bus station, several markets and restaurants. Very Friendly. Close to the Bus terminal that connects you almost to everywhere on Malta. Quite and clean rooms.